We reported about Micromax A91 and then Huawei Ascend Y300, both of the these have been launched in the range of below 10,000 INR (not much below this price but nearly 8k INR). Today we will be talking about another phone in this same range which has been launched by Karbonn and it has been named as Karbonn A12. Previously we reported that Zen has copied all the specs of Micromax A116 Canvas HD and then have named it as Ultrafone 701HD and it was a smart move taking in account the over-booking of Canvas HD which Micromax is not able to meet. It seems that same strategy has been followed by Karbonn with this product A12 where all the specs match with the hard parameters of Micromax A91 and the best part is its price which is lower by 600 INR when compared with Micromax Ninja A91. 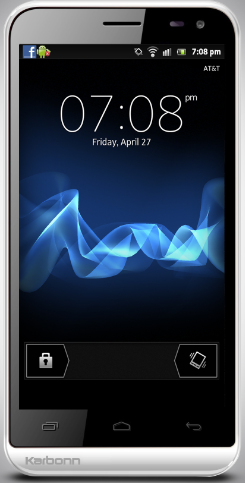 So, the users have a valid to go for Karbonn A91 rather than Micromax A91. Starting with its hardware specification then it has 4.5 inches of screen size with multi-touch feature and when talking about the power then it has 1GHz ARM Dual Core processor, nothing about the make and the cores of the processors has been mentioned but the frequency at which this processor has been clocked is similar to that of Micromax Ninja A91. The internal storage capacity of the phone is 4GB it has be extended up to 32GB with the help of external storage slot. The primary camera is of 5MP but it does not do HD video recording and the secondary camera is a VGA camera (whose spec in MP has not been specified). The battery strength is also similar to that of Micromax Ninja A91 which is 1800mAh and they both use the old operating system on the board which is Icecream Sandwich (Android v4.0). This phone is available at 7,990 INR and as of now we do not have the details of the online store from where it can be ordered, we will keep you updated with any info regarding it.